Model at New York Fashion Week showing a Louis Vuitton handbag. "Purse" or "handbag" or "pouch"
The term "purse" originally referred to a small bag for holding coins. In British English, it is still used to refer to a small coin bag. A "handbag" is a larger accessory that holds objects beyond currency, such as personal items. American English typically uses the terms purse and handbag interchangeably. The term handbag began appearing in the early 1900s. Initially, it was most often used to refer to men's hand-luggage. 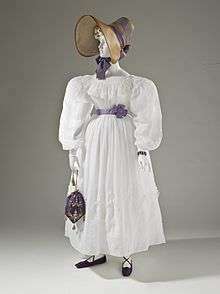 Women's bags grew larger and more complex during this period, and the term was attached to the accessory. Handbags are valued for their stylishness as visual accessories as well as for their function. The modern purse, clutch, pouch or handbag came about in England during the Industrial Revolution, in part due to the increase in travel by railway. In 1841 the Doncaster industrialist and confectionery entrepreneur Samuel Parkinson (of butterscotch fame) ordered a set of travelling cases and trunks and insisted on a travelling case or bag for his wife's particulars after noticing that her purse was too small and made from material that would not withstand the journey. 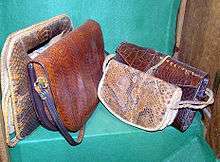 He stipulated that he wanted various handbags for his wife, varying in size for different occasions and asked that they be made from the same leather that was being used for his cases and trunks to distinguish them from the then-familiar carpetbag and other travelers' cloth bags used by members of the popular classes. H. J. Cave (London) obliged and produced the first modern set of luxury handbags, as we would recognize them today, including a clutch and a tote (named as 'ladies travelling case'). 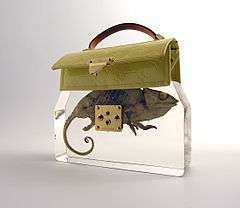 These are now on display in the Museum of Bags and Purses in Amsterdam. H. J. Cave did continue to sell and advertise the handbags, but many critics said that women did not need them and that bags of such size and heavy material would 'break the backs of ladies.' H. J. Cave ceased to promote the bags after 1865, concentrating on trunks instead, although they continued to make the odd handbag for royalty, celebrities or to celebrate special occasions, the Queen's 2012 Diamond Jubilee being the most recent. However, H.J. Cave resumed handbag production in 2010. The oldest known purse dates back more than 5000 years, and was a pouch worn by a man, Ötzi the Iceman. Men once carried coin purses. In early Modern Europe, when women's fashions moved in the direction of using small ornamental purses—which evolved into handbags—men's fashions were moving in another direction. Men's trousers replaced men's breeches during the course of the 18th and 19th centuries, and pockets were incorporated in the loose, heavy material. This enabled men to continue carrying coins, and then paper currency, in small leather wallets. Men's pockets were plentiful in 19th century and 20th century trousers and coats, to carry an ever-increasing number of possessions, such as pipes, matches, pocketknives, and so on, and they were an item frequently mended by their wives. 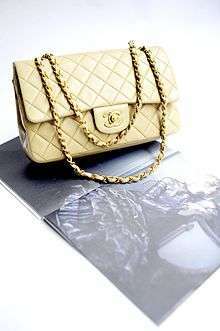 Women, on the other hand, have shown a strong demand for larger handbags that carry more items for everyday use. Men's purses were revived by designers in the 1970s in Europe. Since the 1990s, designers have marketed a more diverse range of accessory bags for men. The names man-purse and murse have been used. The designs are typically variations on backpacks or messenger bags, and have either a masculine or a more unisex appearance, although they are often more streamlined than a backpack and less bulky than a briefcase. These bags are often called messenger bags or organizer bags. The leather satchel is also common. Demand is strong after several years of popularity, possibly supported by the growing range of modern electronic devices men carry with them. Men's designer bags are produced by well-known companies such as Prada, Louis Vuitton, Coach, and Bottega Veneta in a variety of shapes and sizes. The global men's bag and small leather goods trade is a $4 billion a year industry. Sales of men's accessories including "holdall" bags are increasing in North America. Lighted: a handbag with a lighting system which has been attempted since the 1950s without success until recently when in 2011 the first successful lighted handbag was brought to market. Pouch: small bag such as a pocket, teabag, money bag, sporran, etc. Bucket bag with drawstring closure. Vintage clutch with fold-over closure, made of red snakeskin. Hobo bag with top zipper, shoulder strap, and characteristic slouch in the middle. Collection of kiondo style handbags. 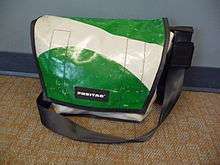 Messenger bag from old truck tarp with seat belt as strap, made by Freitag, Switzerland (2008). Saddle shape, with equestrian hardware detail. Tote, in this example the Birkin bag by Hermès. Hobo bag with unique variations, such as a bold abstract print and interesting hardware. Clutch made from eel skin, a strong but expensive alternative to cow, sheep, goat, or pig leather. Vintage evening bag, made of ivory satin encrusted with faux pearls and glass bugle beads. Duffle bag: a large cylindrical bag usually used for travel or sports gear, sometimes called a "weekend bag"
Security bag: protects the carrier from travel theft and includes an invisible stainless steel strap sewn into the fabric and a protectant on the main zipper. 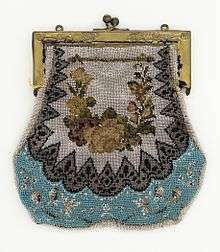 1860 Woman's handbag with frame and kissing lock (LACMA). A distinction can also be made between soft-body handbags or frame handbags, where a metal frame supports the textile or leather of the bag. Frame bags often use a kissing lock closure, with two interlocking metal beads set on the top of the frame. Kissing locks were popular on handbags during the early- to mid-20th century, and remain popular with vintage collectors and in "retro" designs. These locks are still seen on smaller change purses. Diamanté clasps were in use by the 1930s. In later decades, designers found popular success with zipper enclosures, flaps, and even magnetic clasps hidden in the fabric of handbags. 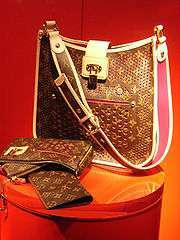 The need to organize one's belongings is universal, thus handbags exist in differing forms in cultures around the world. People have been quite clever in thinking of ways to use the materials at hand to create their bags; this section shows many different examples of handbags. 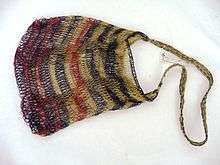 A bilum bag, used in Papua New Guinea. Bilums are made of "bush rope", cuscus fur or wool, and expand in size. A shoulder bag made of baobab tree fibres, bought in Zimbabwe in 1995. Ojibwa bag with decorative beadwork; this particular bag was probably made for a child. Early 20th century Yoruba Diviner's bag, from the Oyo region, Nigeria. A Burmese Kachin bag or wallet. A Figure from the booklet Burmese Textiles, published in 1917 by Laura E. Start. A Scandinavian Sámi purse (handbag) with shoulder strap. A Betel bag from West Timor, made around 1921. 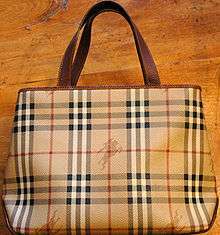 Called an aluk, such bags are still made. A modern handbag in a traditional Hakka Chinese-style floral fabric design. North African bag with lizard head and paws. 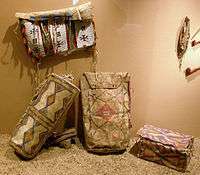 19th century bags and pouches of the Sioux. Bags exhibited in the Yunnan Nationalities Museum, Kunming, Yunnan, China. 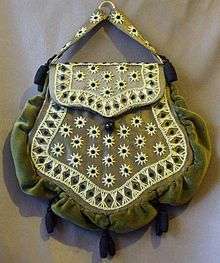 Tanner Krolle Eva bag (2006). 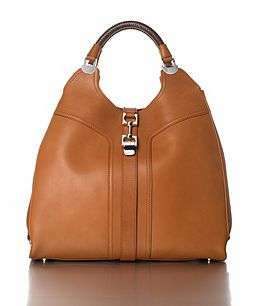 A handbag from French designer Etienne Aigner. Handbag shaped like vintage Volkswagen bus (2007). A classic-looking bag made from black microfiber cloth. Crocheted bucket-style handbag by Sak.com. Handbags at the 2010 FONART exhibition in Mexico City. Colorful handbag made from recycled materials (2012). JulieApple's Yoga-a-GoGo bag made by AirDye technology that dyes fabric without the use of water. ↑ Browning, Marie (2006). Purse Pizzazz. Sterling Publishing. p. 8. ISBN 978-1-4027-4065-7. ↑ "I was handbagged by Mrs Thatcher". Ollie Stone-Lee, BBC News. 9 April 2013. Retrieved 17 June 2014. ↑ "Los Angeles County Museum of Art". Collectionsonline.lacma.org. ↑ Hagerty, Barbara G. S. (2002). Handbags: a peek inside a woman's most trusted accessory. Running Press Book Publishers. pp. 14–5. ISBN 0-7624-1330-1. ↑ Stockley, Philippa (2 September 2012). "Yes, the contents mean a lot, but it's the bag that matters most". The Independent. Retrieved 27 September 2015. 1 2 Pederson, Stephanie (2006). Handbags: What Every Woman Should Know. David & Charles. p. 8. ISBN 9780715324950. ↑ Gerval, Olivier (2009). Studies in Fashion: Fashion Accessories. A & C Black. p. 44. ISBN 978-1-4081-1058-4. ↑ Sarti, Giorgio (2006). Vespa: 1946-2006: 60 Years of the Vespa. p. 117. ISBN 978-0-7603-2577-3. ↑ Standard & Poor's (2011). Standard & Poor's 500 Guide. "Coach Inc.": McGraw-Hill. ISBN 978-0-07-175491-0. ↑ Clifford, Stephanie (19 February 2012). "Men Step Out of the Recession, Bag on Hip, Bracelet on Wrist". The New York Times. Pedersen, Stephanie (2006). Handbags: What Every Woman Should Know. Cincinnati: David & Charles. ISBN 9780715324950.